Feedback and refactoring on the spot. 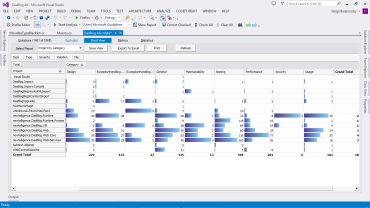 Instant Review allows the running of a select set of rules in the background to provide real-time code issues feedback to developers in the Visual Studio Editor. 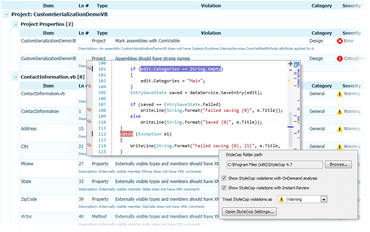 The feature highlights in the editor, code elements that triggered violation and shows a complete list of file code issues in the right violations bar (next to the scrollbar). 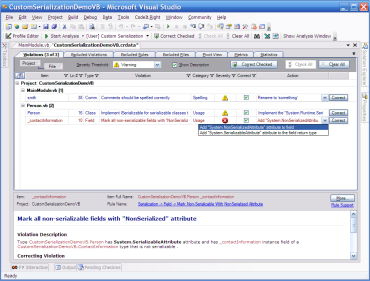 The Violation detail window explains the nature of the issue, offers auto-refactoring options and the option to ignore (exclude) the violation. The feature can be turned on/off with a single click, supports multiple configurable user profiles that can be switched in the toolbar or right margin violations bar context menu. Unique IntelliFix technology will automatically fix violations. 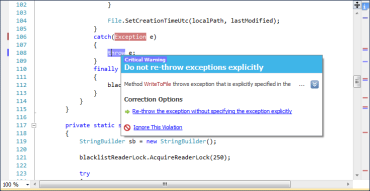 Helps to implement the violation suggestions by correcting your code smells automatically. Follow your own standards, not someone else’s. 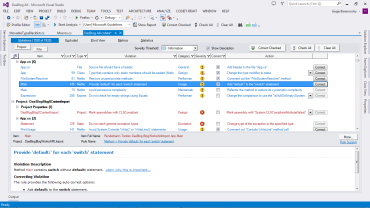 Configure included rule sets based on Microsoft guidelines and industry best practices to your needs, or define your very own standards. Many aspects of the code review process can be automated. Manual code reviews are expensive as they take a lot of time and can be very boring. Many teams dislike manual reviews - some team members take them as a criticism. Many aspects of the code review process are rather mechanical and can be automated with the help of CodeIt.Right. Integrate StyleCop Inspections and fix issues wit auto-corrections. 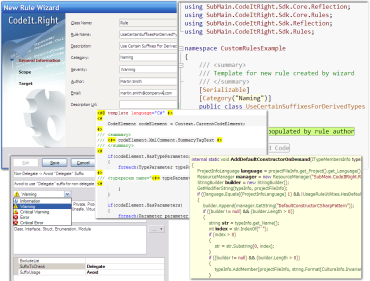 New plugin integrates StyleCop into CodeIt.Right Analysis - Instant Code Review, OnDemand Analysis and Continuous Integration. You can run StyleCop Inspections with real-time feedback in the VS Editor, on demand when you need them or as part of your build process. The results can be part of the comprehensive CodeIt.Right analysis and you can correct StyleCop issues with CodeIt.Right auto-corrections. Extensive and customizable set of reports. Includes extensive and customizable set of reports which you can take anywhere with you - print or export them. You can also generate your team guidelines document based of the profile that you configured, literally with a single click of a mouse.